Apologies can be difficult, even awkward, to make, especially in the workplace because you are dealing with personal feelings in a professional setting. However, apologies are almost always appreciated when they are well thought out and sincere. While some people believe apologies, particularly in the workplace, are a sign of weakness, they can instead demonstrate that you are capable and in control – after all, an apology establishes that you recognize an error and how to fix it. While apologies are important, you also want to avoid constantly apologizing for every little thing in the workplace. If you give a formal, elaborate apology for every minor transgression, coworkers and employers may begin to see you as weak and insecure. So if you accidentally leave your coffee mug in the kitchen sink, or if you show up a minute late to a coffee date with a colleague, a concise “I’m sorry” ​in the moment might be all that is needed. On the other hand, if you were late for work when you really should have been there, an apology may be in order. It is important to seek a balance between over-apologizing and not apologizing at all. If you have done something to inconvenience a prospective employer, such as showing up very late or not at all to an interview or not handing in application materials on time, you should apologize. The entire job search process is your chance to demonstrate your personal and professional qualities, and if you have demonstrated a quality that you do not think is appropriate (such as tardiness or rudeness), you need to address the issue. Every apology will differ in method and content based on the issue for which you are apologizing, and the person or people to whom you are apologizing. However, below are some tips that can make almost any apology effective. Apologize as soon as possible: This will help you avoid letting negative feelings fester. 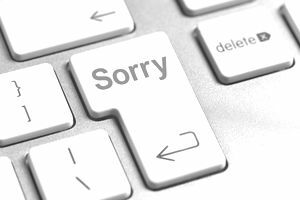 Sometimes, especially for minor transgressions, you can apologize immediately after the event (such as if you are late meeting up with a colleague for lunch). When apologizing for a particularly awful transgression, you might need to wait a couple of hours or even a day, in order to let everyone involved calm down and process the situation. No excuses: An apology is not your chance to give excuses for what you did. To avoid giving excuses, speak in the first person (“I am very sorry”). Avoid phrases with the words “but” and/or “if” (Phrases like “I’m sorry if you think I hurt your feelings, but…” are not apologies, but excuses). Be sure to actually say the words “I am sorry” or “I apologize” in order to clearly express your remorse. Take responsibility: After saying you are sorry, clearly and concisely acknowledge what it is you did wrong (“When I did not hand in my assignment for our group project, I let down the entire team”). Admit to the rule or norm that you violated in order to take responsibility for your specific mistake. Explain how you will fix it: Once you have mentioned why you are sorry, explain what you will do to prevent this issue from happening in the future. For example, if you missed a deadline for a team assignment, explain to your colleagues that you have developed a new way to organize your schedule that will prevent you from missing deadlines in the future. Saying “this will never happen again” means nothing unless you explain what steps you are taking to ensure this. You might also consider asking the person to whom you are apologizing if there is anything else you can do to remedy the situation. Follow through: If you say you will work harder at responding promptly to emails, do so. If you promise a remedy and do not follow through, the apology is meaningless. Follow through with your solution to the problem. Consider the method: Some apologies need to be said in person. If you made a big mistake with your boss, for example, you might need to meet in person to discuss the transgression in detail. However, if you know you are very bad at dealing with these situations in person, or if you feel you will become too upset or say something incorrectly, you may want to send an apology email. You can also choose a middle ground, for which you apologize via email and ask the person if they want to meet in person to discuss the matter further. This is an apology email example. Download the apology email template (compatible with Google Docs and Word Online) or see below for more examples. I want to apologize for mixing up the files for XYZ Company and ABC Company. My careless mistake hurt our sales pitches, and almost lost us two key clients. When we work together on a sales pitch, I realize it is important that we can confidently rely on each other to complete our assignments. When I made a mistake, I let you down. I am currently developing strategies to ensure that I never make that kind of sloppy error again. I have developed an even clearer organization for my online client files that will make it impossible for me to confuse one file for another. I have also spoken with our supervisor and explained that the error was completely my fault, not yours. I understand that I have damaged our working relationship. However, I greatly value you as a colleague, and I believe that we have worked well together as a sales team in the past. I hope that you will be willing to work together in the future. Please let me know if there is anything else I can do to make this possible. The following is an example of an email apology from a manager to an employee for inappropriate behavior at work. Depending on the severity of the offense, the manager might want to either meet with the employee in person (perhaps with an HR person present) or write a formal written letter. I am very sorry for my behavior in the staff meeting this morning. I cut you off in the middle of your presentation and criticized your performance in front of the staff. This was not only unprofessional but also simply disrespectful. I let my stress about a personal matter impact my management of the office. I have always said to you, and to all my employees, that I want this office to be a place where you all feel comfortable sharing ideas with one another. When I yelled at you publicly for a small error in your presentation, I damaged that collaborative environment. I am taking steps to make sure I do not lose my temper in that way again. I am working to manage my stress so that I do not let it impact the way I interact with my employees. I also know how capable you are of conducting a terrific staff meeting. I would, therefore, love for you to lead the staff meeting next week. I am very sorry again. Feel free to contact me if you would like to discuss this matter further.